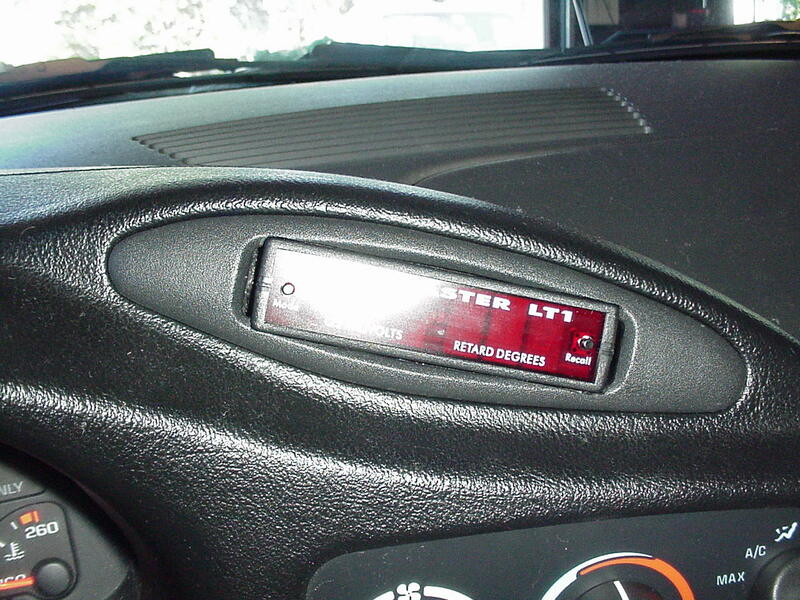 The ScanMaster is another neat gadget put out my Mike Licht of Modern Musclecar. It is an EXCELLENT tool for monitoring of engine parameters, tuning of modified LT1s, and diagnosing problems. I think it's the best out there for continuos monitoring since it can be easily mounted. For you Firebird/Trans Am guys, here is an excellent page detailing the install for you. Fred Forsythe has also developed and EXCELLENT page going into GREAT detail about just what exactly you are seeing on the ScanMaster. This is a "must look at" page for any owner of not only a ScanMaster but any type scan tool! UPDATE: Just found out that someone else has also installed the ScanMaster into an air conditioning vent... but he put it in the left vent :) To see what this looks like, check out Brian's Supercharged F1 Camaro Page. 1. You have to pull down your glove box. The way the glove box stays "up" is kinda cheesy :) To drop the glove box open it and you'll then notice that it is held there from falling by plastic "ears" on the back side of the glove box. Just take the side of the glove box compartment and push it towards the center. You'll notice it start to cave in a bit at which point you can pull that ear over the piece that it catches on. Do the same for the other side. This allows access to the three 9/32" screws for the radio trim. Remove these three screws. 2. You now have to remove the panel under the steering column to gain access to the other side of the radio trim piece. This is held in place by two Phillips head screws and two 9/32" screws on the bottom side. Go ahead and remove these. If you have a rear window defroster as I do, you'll have to unplug this connection once you pull this panel partially away. To do this remove the white clip as shown below to the left. On the right are the other two 9/32" screws that need to be removed to remove the radio trim. Remove these and pull off the radio trim piece. 6. Now that you have the vent out, go ahead and remove the swivel part from the vent assembly. You can do this just by pulling it apart a little and pulling out. If you have trouble, you can use a small flat headed screwdriver to push in on the pin that holds it in place. 7. There is a piece of duct work that connects this vent to the main system that now needs to be removed. You can see it in the picture to the left. When you pull it out, it will look like the picture on the right. 8. Now we can't just have air blowing around doing nothing inside the dash, so we now need to block this hole. I was going to try shoving a ball or something in there but didn't have anything the right size available so I went the never fail route... duct tape! :) You can see what needs to be blocked off in the picture to the left. The picture on the right shows my duct tape work in action! I hacked mine up with my Dremel using a cutting wheel/sanding disc . Either of these will cut through the plastic like butter. I recommend studying both the ScanMaster and the vent to get a good idea of what you want to do before you turn on that Dremel. Also, a steady hand helps because you are going to be getting very close to visible areas... one slip and you just bought yourself a new vent :) Below are various angles of what the finished product should look like. The idea is is to cut the plastic all the way to where the vent plastic starts to turn textured. This will allow the ScanMaster to sit closer to the front of the vent. The "flaps" that are created help to hold the ScanMaster in place. Also, take a drill and drill a couple small holes in the side flaps. This will allow you to connect wire or tie-wraps to hold the ScanMaster in place. Since this vent wasn't actually designed to hold a ScanMaster, it's not quite a *perfect* fit... although very close! Because it's not a perfect fit, there is about 1/16" around the sides and top/bottom of the ScanMaster when it is inserted into the vent. I was able to overcome this small problem with a couple pieces of cheapo black carpeting (I got it from either Wal-Mart or AutoZone for $7 a while back). Just cut four pieces about the size of the four sides of the ScanMaster in length. I folded the side pieces then used a knife to push them in from the back. The top and bottom pieces I laid carpet side facing the ScanMaster and used a butter knife again to push them in place. It ended up looking pretty good! When looking at it from the front, you can just see the carpet on the sides and only a very small portion of it. The carpet for the top and bottom I put there more to prevent being able to see light from the back (since the windshield defroster would allow light to come in from the back). Below are the pieces of carpet I cut. Now you have to secure the ScanMaster in the vent. I did this by using small tie-wraps. I suppose you could use wire but I had tie-wraps laying around so I used those :) Here is what the tie-wraps look like. It is VERY snug in there and won't be going anywhere! The pic is a little bright but I did that on purpose so you could easily see the tie-wraps. And now the finished product mounted in the vent! The rough part is over! Now it's on to the fun part... connecting it all up! 11. Now it's time to make the electrical connections. I made mine at the ALDL port itself. Everything is there that is needed for this device to work. For those that don't know, the ALDL is located just above your right shin when you're sitting in the car. Here is a picture of it. 12. To make this a little easier, pull down the plastic piece that goes around the ALDL connector. This is held up by a couple ribbed plastic pins. Just pull down kinda hard and they will come out. Once you've done this, unscrew the two 9/32" screws holding the ALDL port in place. It will look something like this. 13. Now that you have easy access to the ALDL wires, it's time to make the electrical connections! Go ahead and feed the ScanMaster wires down from the top. You can easily see an area for them to go through to the ALDL connector, but it might take a little fishin' to get them to go. Since I also have a 94 Z28, I wanted to add a little flexibility with this install so I could swap the ScanMaster between cars if I ever wanted to. So, I installed a couple connectors about 8" or so from the ScanMaster itself. I got these from Radio Shack and soldered the wires in place. Here's what it looks like... in case you have another LT1 and want to do the same. This will allow me to easily unplug the ScanMaster. For the connection to the ALDL wires, I used red Scot-Lok (I think that's the name of them :) connectors. They allow splicing into wires without having to cut any wires. They make splicing very easy when working in a tight area such as this! On my 96SS, the connection is as follows: The ScanMaster RED wire is the power wire and gets connected to the ORANGE wire on the ALDL connector in location #16. This is a nothing more than a power feed from the cig lighter, fuse #11. The ScanMaster BLACK wire gets connected to the BLACK wire on the ALDL connector in location #4. This is your ground wire. The ScanMaster WHITE wire (data wire) gets connected to the TAN wire on the ALDL connector in location #9. Keep in mind, these are locations for a 96 with an OBDII connector so if you have a different year, yours may be different. Here is what the connections look like when finished. Go ahead and try her out! If it doesn't work, check your connections as sometimes these splice connectors don't always work like they should. Once you get your connections made and the unit working, go ahead and button this up down here by reattaching the ALDL connector to the frame piece and reinstalling the underside dash piece with the two push in ribbed plastic pins. A very easy fix for this problem (and a must do thing if you take your car into the Chevy dealer or have Diacom) is to place a simple single-pole, single-throw switch in the WHITE data wire of the ScanMaster. This will shut the unit down when the switch is turned OFF. This will allow Diacom and the Chevy dealer's monitoring equipment to function properly. I'll keep this paragraph up to date with any info I find that might allow us to use both the ScanMaster and Diacom at the same time. In the meantime, if you have any ideas or suggestions let me know! Next you need to find a good place to mount the switch so you can determine how much extra wire you will need. You can use standard speaker wire if you want. My switch came with long enough wires already attached. Your switch may not have any wires on it all and you'll have to add them yourself. I chose to mount my switch down by the ALDL connector. It's a good location out of the way yet easily accessible. Now that you know where you want to mount the switch, you can make the connections. All you have to do is cut the WHITE wire coming from the ScanMaster and splice in your switch as shown below. I don't normally use wire nuts (normally use the plastic crimp caps) but since I installed the switch in the lower plastic panel I wanted to have the ability to remove this panel in the future without having to cut any wires. If you do use wire nuts, just check them and make sure they are tight! There you have it! Here is what the switch will look like when you get everything put back in place. Now that you have everything working, push the vent with the ScanMaster in place and reinstall all your trim pieces. It's now time to sit back and admire your work because we're done! :-) Below are some pics I took right after I finished. Notice how I have 1 to 2 degrees of knock retard while just idling!?!? Hmmm??? NOTE: For those of you that want to be able to remove the ScanMaster for use in multiple cars, you'll need to cut the vent differently since the above shows the ScanMaster being slid in from the back... unless you want to take out the entire vent each time! If you think you may want to do this, below is a picture (given to me by a person that used this page for his install!) that will give you an idea of what it will look like. By cutting the vent in this manner, you should be able to install and remove the ScanMaster from the front. WOW! It's now been four or five hours since I installed the ScanMaster and I just got back from a trip to town. After actual hands on use, I am VERY impressed! This is even a neater and more useful gadget than I originally thought! :) I am SO glad I mounted the ScanMaster where I did. This location provides for extremely easy access (even while driving) to switch between the different modes of operation. Also, it looks VERY cool at night :) It looks so good that I decided to take my photographic abilities to the limit :) My digital camera has the ability to manually adjust the shutter speed... although I've never used this feature until tonight. I thought I would try to let all you see what this unit looks like mounted in this location at night. I don't have a tripod and I had the shutter speed set to between 1 and 2 seconds so the pics are a bit blurry but not all that bad considering I was holding the camera as still as I could! Well, here are the night time pics!